How many people has the conversion to carry? How many weeks or months (each year) you want to travel? Do I need standing height inside the vehicle? Do I prefer a permanent bed and/or separte convertible benches? Do I need toilet and/or shower at all? Do i want to cook inside and/or outside? Do I have particular special needs? How much money I would like to spend? I am the adventurous or comfort lover or practical focused or Backpacker style typ of traveller? Feel free to download one of the floor plans. Print them out and make a few rough drawings. How would you like your campervan layout should look like? Floor plan for the big commercial van. The Mercedes Sprinter LWB version, modell 413 and 416 (CDI). 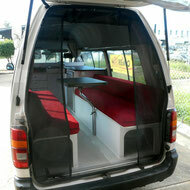 Fiat Ducato Transporter floor plan with dimensions for high roof model- sold in AU from 2000 to 2007. Post 07/2014 Renault Trafic long wheel base floor plan , internal cargo area lenghts is 2973mm. What do I need in my future camper? We created a little questionarie to see what kind of traveller you are and to get a clearer view what YOU like and what you realy need on your trip(s). Have a look and you might surprise yourself.